NASA will hold a formal debate on terraforming Mars tomorrow night at its third Astrobiology Science Conference. In his 1936 classic The Cometeers, science fiction Grandmaster Jack Williamson writes of a sinister green comet; now you can look up and see one. SMART-1, the European Space Agency ship equipped with ion drive propulsion, is now sending back great pictures from the lunar surface. SMART-1 is the first craft to return to the moon in over 5 years. Ah, the space colonies of my youth. They never built any, but the pictures are very nice. Lipson and Malone bring the printing of three-dimensional objects into the home with this project. Green Comet Lovejoy - Cometeers Coming From Below? Where's Giles Habibula when you need him? A green comet approaches the solar system. Keeping track of people with Alzheimer's will get easier once GTX and Aetrex have embedded GPS locators in their shoes. Make a map of your steps and check the statistics. This little gizmo can track you everywhere, indoors and out. 'The glittering little rocket bolted to the black iron behind him.' - Jack Williamson, 1933. That darned Death Star has to get its planet-busting energy from someplace. Now updated by NASA! 'Every atom of ship... was driven around space... by a direct reaction against the space warp itself.' - Jack Williamson, 1936. 'He reached to unsnap the cartograph from his belt. 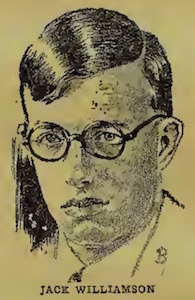 '- Jack Williamson, 1931. 'Terraform the little rock...'- Jack Williamson, 1941. 'The object is built up of an infinite series of plane layers, at the focus of the ray,' - Jack Williamson, 1930. 'A photograph, taken from space, of part of the state of Chihuahua, Mexico. And see!' - Jack Williamson, 1931. 'Darn clever, these suits...' - Jack Williamson, 1933. ''Darn clever, these suits,' he murmured.' - Jack Williamson, 1933. 'A simple mechanism... it drove the iron ball through space like a ship.' - Jack Williamson, 1933. 'The object is built up of an infinite series of plane layers, at the focus of the ray...' - Jack Williamson, 1930.